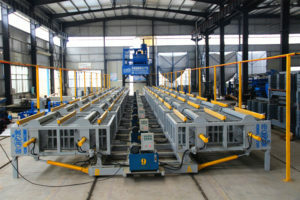 1990 On April 5, Yinan County Construction Machinery Plant, the predecessor of Hongfa Group, was established and mainly produced small scale concrete block making machines. 1994 On March 6, Yinan County Construction Machinery Works renamed as Yinan County Hongfa Construction Machinery Works. 1997 On May 12, Hongfa rented a broken firm named Yinan County Rolling Mill as a new production base for expanding production scale, and the number of employees was up to 200. 2003 On June 8, Hongfa owned its production base by acquiring Yinan County Internal-combustion Engine Plant. 2005 On May 15, Hongfa designed the first Commercial Concrete Batching Plant successfully, and it began to produce at the same time. 2006 On Janurary 1, Hongfa won the honor called "One of China Top Ten Influential Brands in Brick and Tile industry". In June, Hongfa won the auction of 59.3 acres industrial land, with a total construction area of 120,000 ㎡. In August, Hongfa purchased Yinan County Peanut processing Plant. In September, Hongfa was officially renamed as Shandong Hongfa Scientific Industrial & Trading Co.,Ltd. 2007 On March 26, Hongfa began to produce and sell the first AAC production line by independent research and development. 2008 On December 10, Shandong Sino-science Construction & Buiding Materials Machinery Institute established, since then it began to act as Hongfa research institution. On December 16, Hongfa passed ISO9001-2008 certification. 2009 In November, Shandong Hongfa Scientific Industrial & Trading Co.,Ltd built its Vietnam Branch. 2011 On April 22, Guangxi Hongfa Heavy Machinery Co.,Ltd was established. On July 12, Shandong Hongfa Scientific Industrial & Trading Co.,Ltd built its India Branch. On November 10, Shandong Hongfa Scientific Industrial & Trading Co.,Ltd became provincial One Tech.R&D Center. 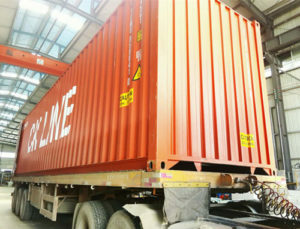 2012 On March 20, Guangxi Hongfa Heavy Machinery Co.,Ltd built its Indonesia Branch. In March, Guangxi Hongfa Heavy Machinery Co.,Ltd put into production with 126 million CNY investment. 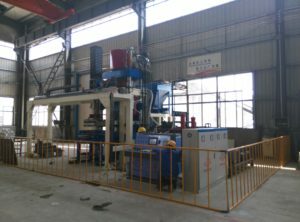 2013 On May 27, Hongfa developed full-automatic non-vibration hydraulic block making machine successfully, which was the first one in China domestic market. On June 13, Guangxi Hongfa Heavy Machinery Co.,Ltd got the benchmarking business model of new wall materials equipment manufacturer reputation. On October 11, Guangxi Hongfa Building Materials Technology Co.,Ltd was establish, which was a subsidiary of Guangxi Hongfa Heavy Machinery Co.,Ltd, and a building new materials comprehensive demonstration base was born with 280 million CNY investment. 2014 On March 12, Hongfa manufactured horizontal lightweight concrete wall panel system began to sold it in market. 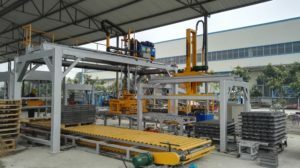 And On December 16, Hongfa vertical EPS wall panel production line was born. 2015 One February 16, Guangxi Hongfa Heavy Machinery Co.,Ltd got the reputation of pilot enterprise for new building materials by Guangxi Housing and construction office. In February, Hongfa Group established another subsidiary named Shandong Lianfeng New Building Material Machinery Co.,Ltd. On October 30, Guangxi Hongfa Heavy Machinery Co.,Ltd became high-tech enterprise.